If there’s one thing that’s integral to rap music, it’s flow. Flow is rhythm, flow is rhyming, flow is intonation, flow is speed. Flow is what differentiates the likes of Run-DMC, Eminem and Kendrick Lamar from, say, someone simply reading out words over a beat. Flow is also integral to drama, the way the narrative takes us on a journey from scene to scene. And sadly – and ironically enough – what’s missing from Licensed to Ill is flow. 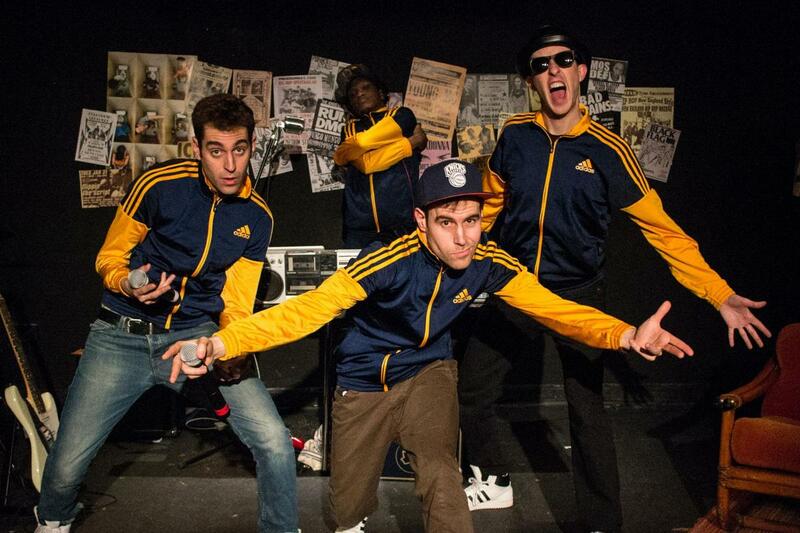 The four-strong cast have created a show that details the rise of The Beastie Boys, one of the longest running and most successful white rap acts in music history (until Eminem came along at least). They begin with the humble beginnings of hip-hop itself – the block parties in 1970s New York that popularised the use of breakbeats and record scratching – and lead up to the band’s induction into the Rock And Roll Hall Of Fame in 2012 followed by the tragic death of founding member Adam “MCA” Yauch. The show consists of short scenes and live performances of some of The Beastie Boys’ best known hits – it’s essentially a jukebox musical, albeit an unpolished one. There’s a scrappiness to the production with its low budget props and dialogue which feels semi-improvised. There’s also little sense of time passing; one moment we’re learning about rap via a short and snappy introduction, the next the band are creating their first album in the mid-1980s; another jump and suddenly it’s two decades later. The show might be as raucous as the band themselves, but it does little to place their music into any sort of context, or comment on their cultural relevancy. It’s mainly focused on telling the story of the band rather than making any wider reaching points. Nowadays The Beastie Boys are probably best known for tracks like (You Gotta) Fight For You Right (To Party!) and Intergalactic, punk-rap songs that paved the way for future rock-rap crossovers. They may not have embodied the effortless swagger of their black rapping counterparts, but they had a sense of laddish self-knowing humour that was cool in its own way. This doesn’t fully come across in the performances here. It’s not always easy to tell if this is meant to be a serious impersonation of the band or more of a parody. Either way, there’s an awkwardness to the performances of Simon Maeder (Mike D), Adam El Hagar (MCA) and Daniel Foxsmith (AdRock), though their energy is undoubtedly impressive. They can’t quite sustain this tempo across the length of the show though and things eventually slow down. Tope Mikun, however, is hilarious, jumping between a variety of roles. There’s plenty of loud, brash banter here, the funniest moments taking the form of awkward audience interactions (like recreating a certain music video); the humour also undermines the potential sentimentality of the serious ending. As whole it’s not without charm and has moments which are enjoyable but it never quite takes off.